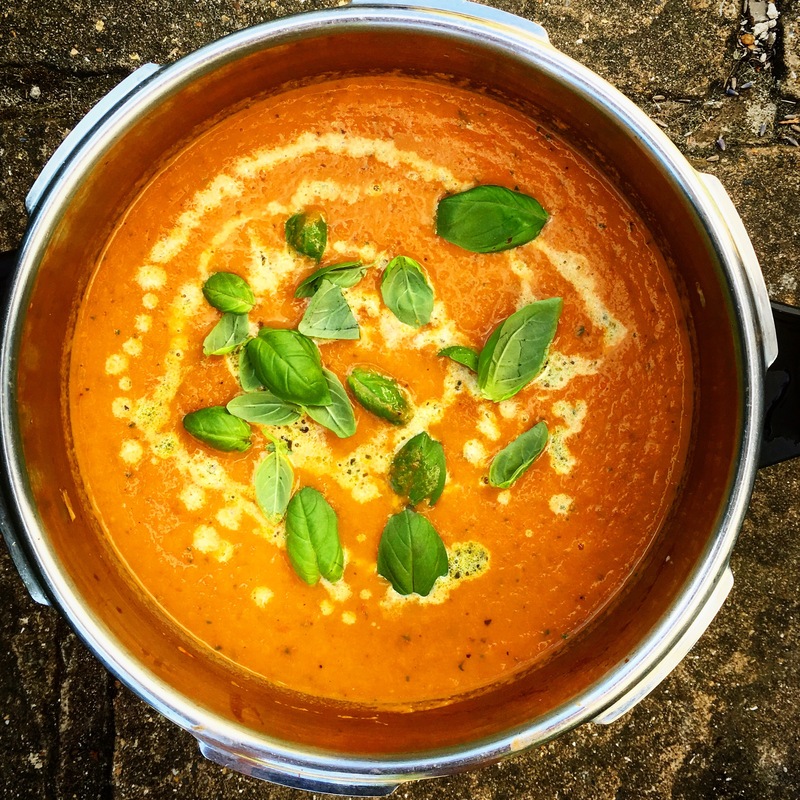 You may think it’s strange for me to be posting a recipe for tomato soup in the midst of the current heat wave but the truth is I really love soup! No matter the weather, even when it’s boiling hot, I can still manage a steaming bowl of soup for lunch. 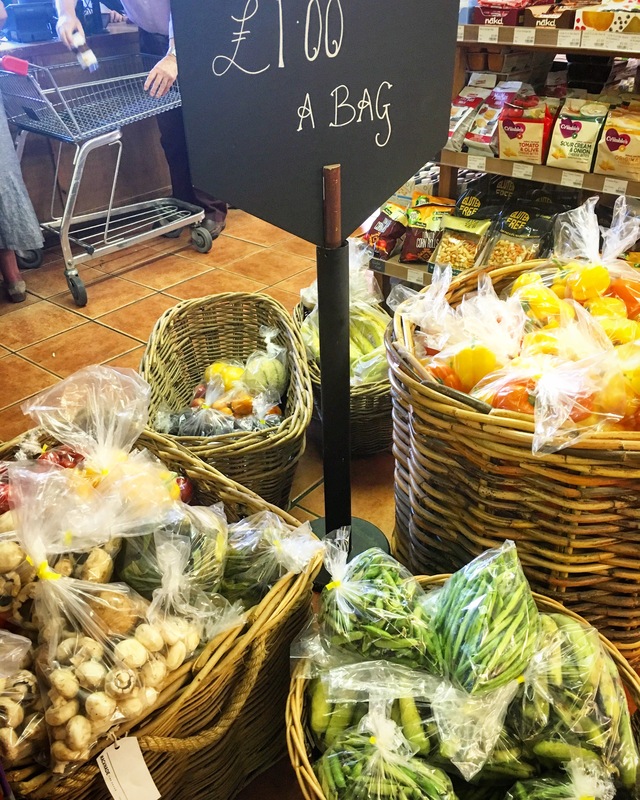 Plus now is actually the best time to make tomato soup, even if you don’t grow your own tomatoes your local farm shop is sure to be selling huge bags of them for about £1. They’ll be a lovely deep red, really ripe and full of flavour- just perfect for soup! In all my years on this earth I am yet to find a soup I didn’t like. Although the variety of fresh soups available now is immense there are countless benefits of making soup at home. For starters it’s much better value but more importantly you know exactly what’s in it! Often ready-made soups are full of hidden sugars and preservatives – things we don’t want to be feeding our mind or body! 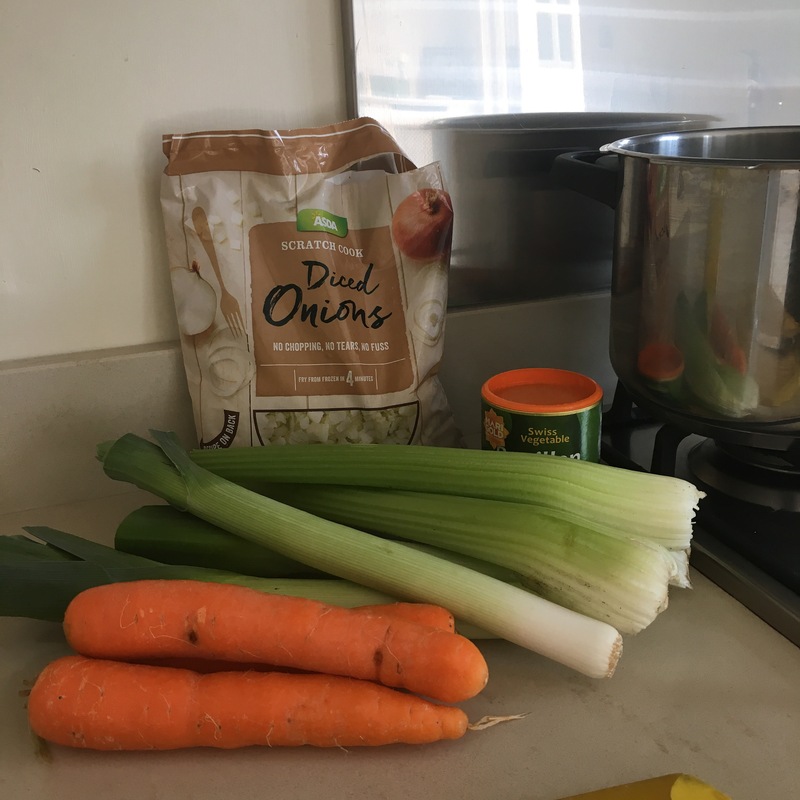 Whatever you can find on offer in your local supermarket, even if it’s slightly past it’s best, can usually be turned into a pretty decent soup. 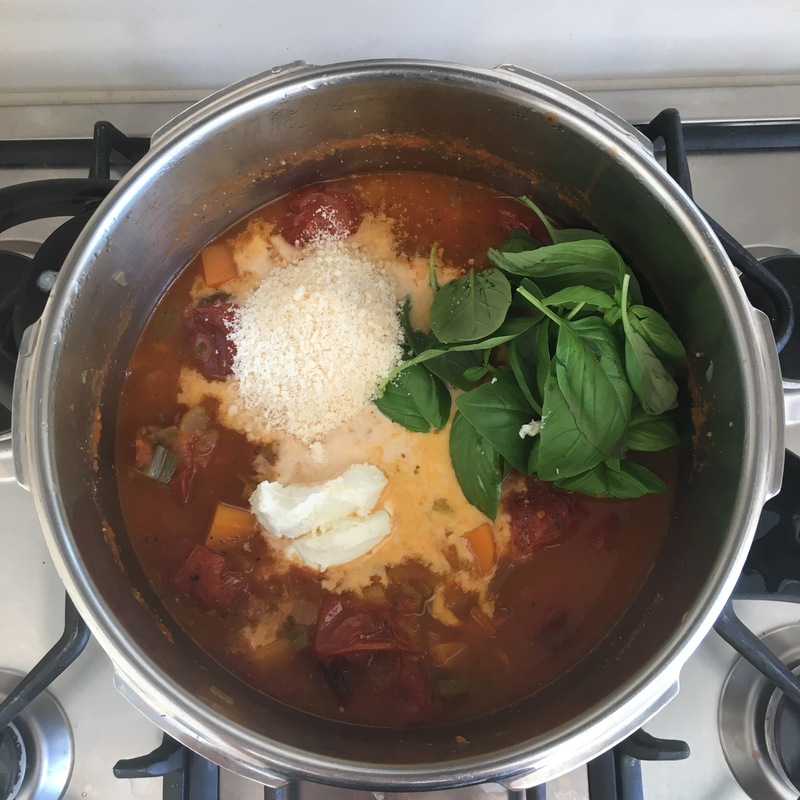 It’s a perfect way to get down a few of your 5-a-day too, if you’re someone who doesn’t really love the taste of vegetables then this soup is brilliant for you, it’s got lots of veg in but still tastes like a delicious, creamy tomato soup. 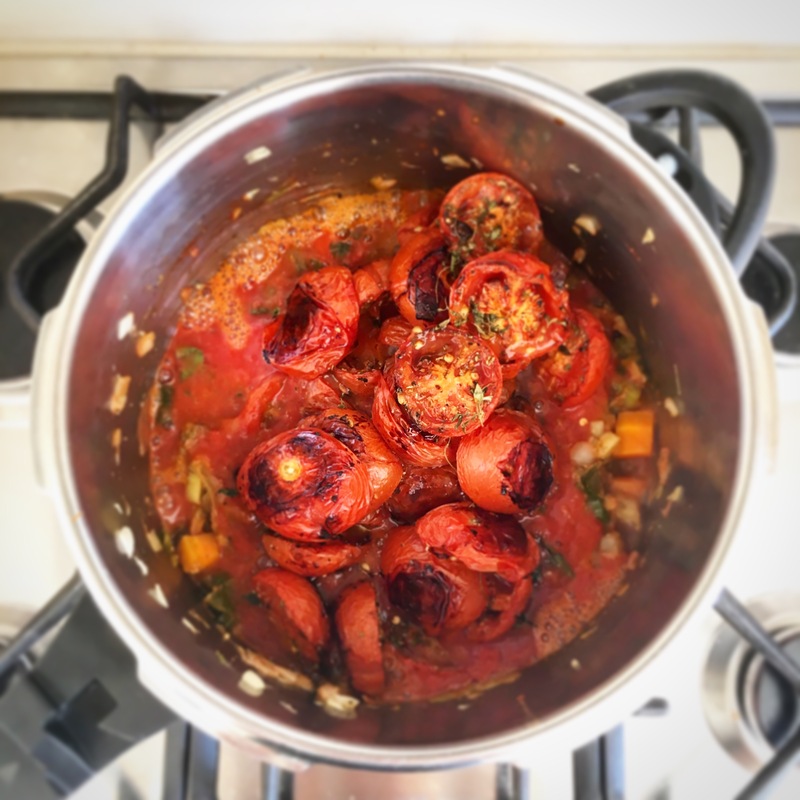 Tomatoes are such a great ingredient; they contain a wealth of nutrients and vitamins, they really are super healthy, plus they taste great too. Roasting them first really helps to deepen the flavours, but if you’re short of time you could just add them diced. 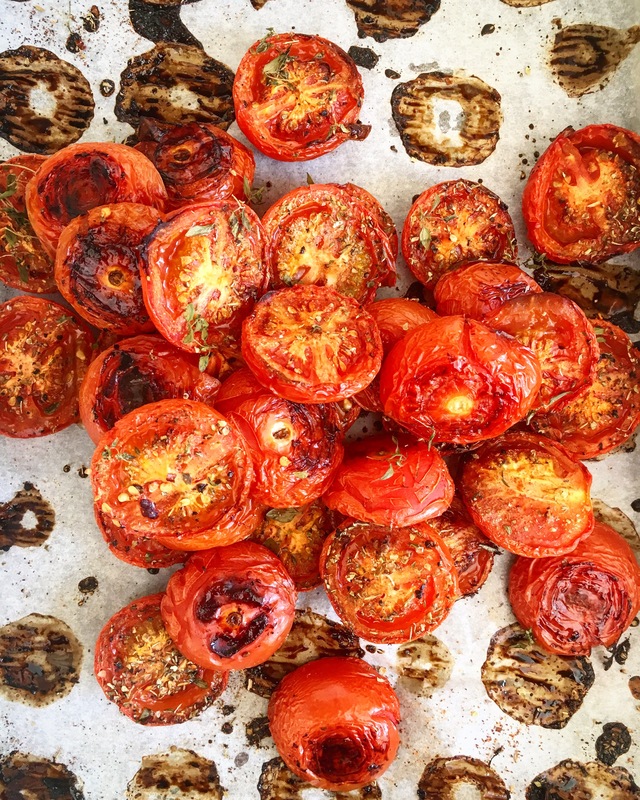 Tomatoes are a brilliant source of Lycopene, a pigment that gives them their distinct colour and is an antioxidant. This chemical helps protect our bodies against cell damage and previous research shows that foods high in antioxidants, like tomatoes, can help to prevent symptoms of anxiety and depression too. One study which assessed the mental heath of about 1000 Japanese people found that those who reported eating tomatoes two to six times a week were 46% less likely to report mild or severe symptoms of depression than those who ate tomatoes less than once a week. No such association was found with any other vegetable. 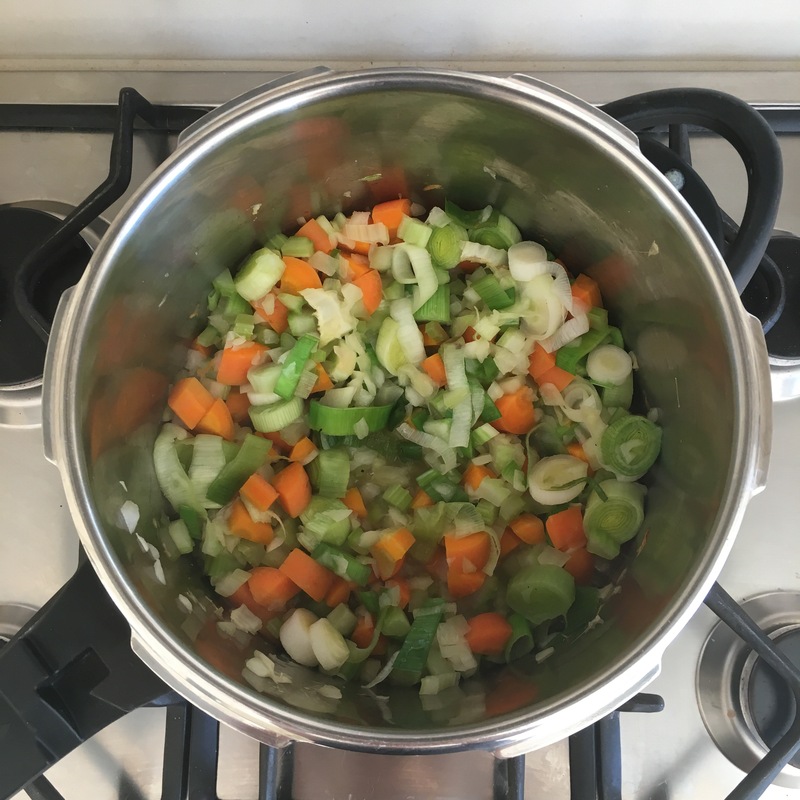 Often on a Monday or Tuesday I clear out the fridge of the last remaining vegetables and make a batch of soup that will feed me for the whole week. If you keep stock cubes on hand and have a root through your store cupboard, you’re bound to find loads of herbs & spices or ingredients that will give your soup a boost. Such as pesto and dried oregano for an Italian twist, fish sauce, chilli & lime if you fancy a bit of Thai. Try honey, harissa paste & cinnamon for a Moroccan flavour. I will happily eat the same soup for a week, each day I add something different to vary it a little. Extra fresh herbs & chilli, sliced chicken or prawns leftover from the previous evening, grated cheese & croutons. Any I don’t eat just goes in the freezer in labelled pots ready for defrosting when I want it. Everyone should have a recipe for really good tomato soup, I think this is it, and hopefully you will too. Enjoy eating and making this my good mood food tomato soup! 150g diced onions, I use frozen chopped onions because I hate chopping onions!! Heat oven to 200C/180C fan/gas 4. 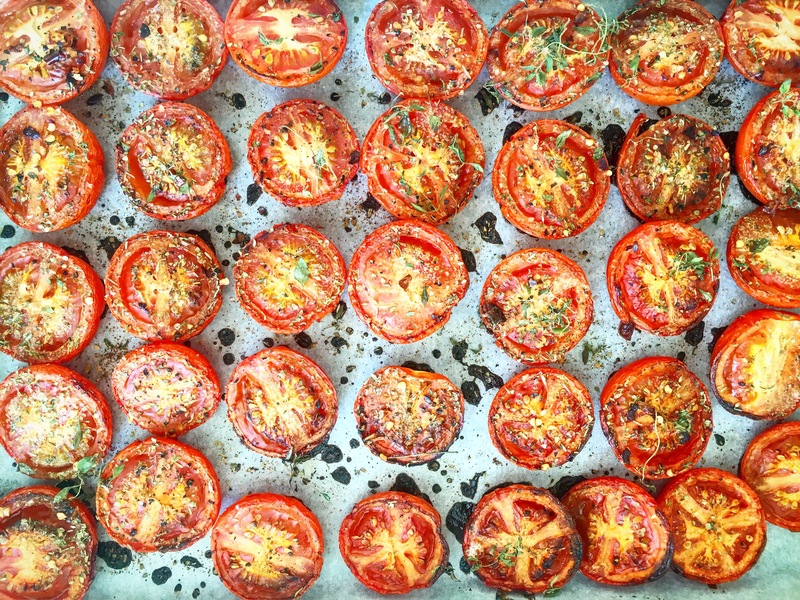 Lay your tomatoes cut side up on a large tray, or two smaller trays, line with parchment. Season with the garlic granules, half the Worcestershire sauce, half the oregano, the thyme, a few basil leaves and some salt and pepper. Roast for 1 hour. 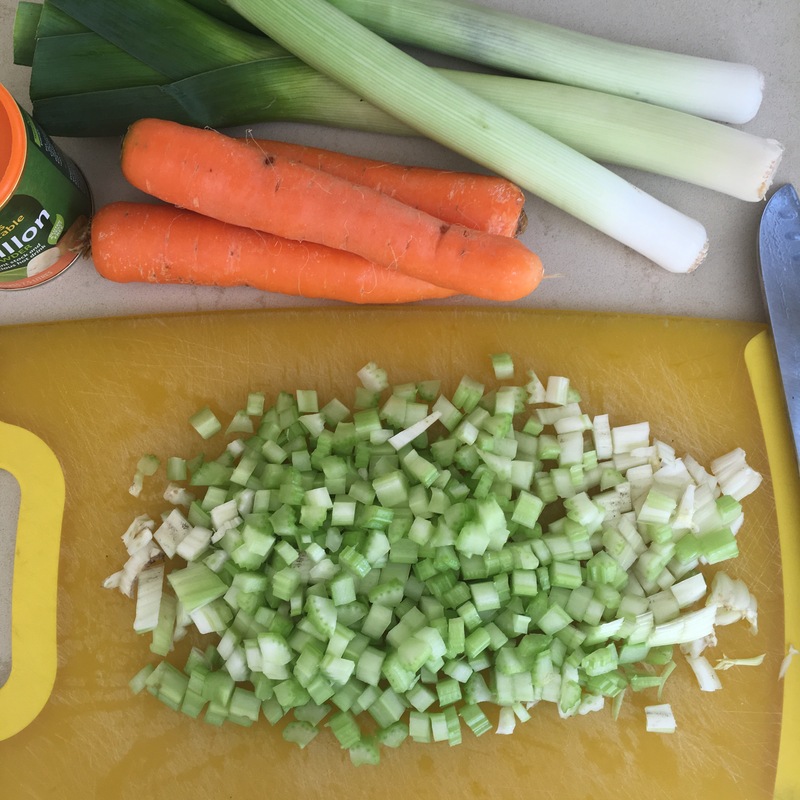 Meanwhile put the onions, carrots, celery and leeks in a really big pan with the wine and bullion and cook gently for about 25 mins, stirring occasionally, until soft. Add the garlic, oregano, sugar, tomato puree, half the pesto, rest of the Worcestershire sauce, and some salt and black pepper. Stir and cook for 1-2 minutes. Add the roasted tomatoes and any juices from the tray, stock and tinned tomatoes. Simmer for 30 minutes stirring occasionally. Set aside 2 tbsp of the milk and then add a handful of basil leaves, the rest of the milk, soft cheese & Parmesan to the soup and stir until the cheese has melted in, blitz with a stick blender until smooth. Add extra water if it’s too thick. Taste; season again if you need to. Add 1 the rest of the pesto to the reserved milk and stir until combined. 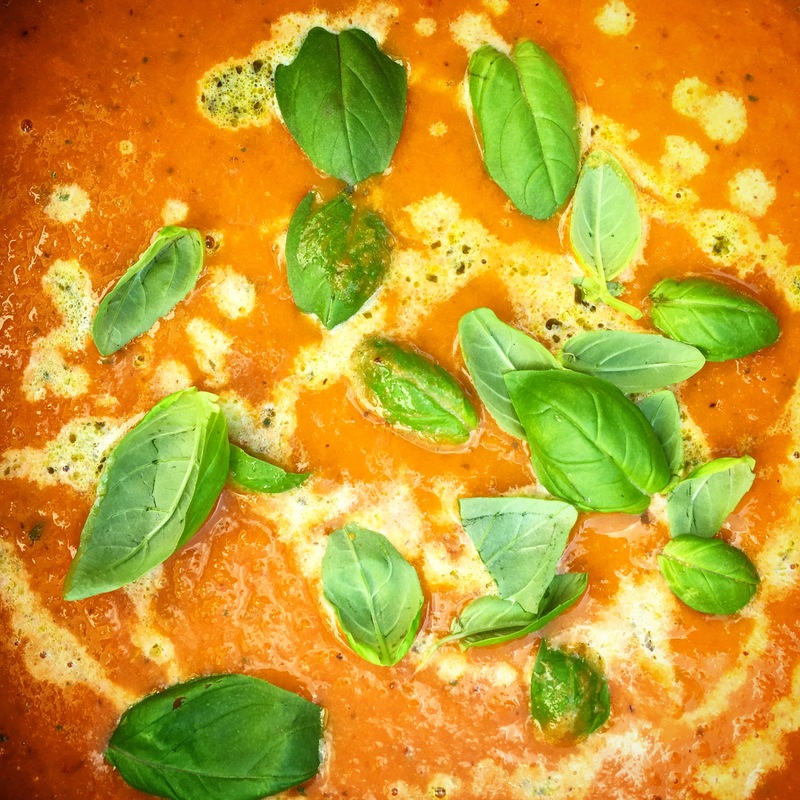 Serve the soup drizzled with the creamy pesto and some more fresh basil.